In a hurry out of door to the office? But need some good tasting lunch to go? Add a box of Kroger Brand Macaroni and Cheese. Why Kroger? at least it doesn't have Yellow Color #4 or whatever the other brands use. And it tastes pretty good. You can always make from scratch... adding butter, and shredded cheese, and cream roux. For this one, after Macaroni Cheese is prepared, Add a big handful of Salad Mix from COSTCO - Kale Salad Mix. Stir it up, and Voila! Your lunch. 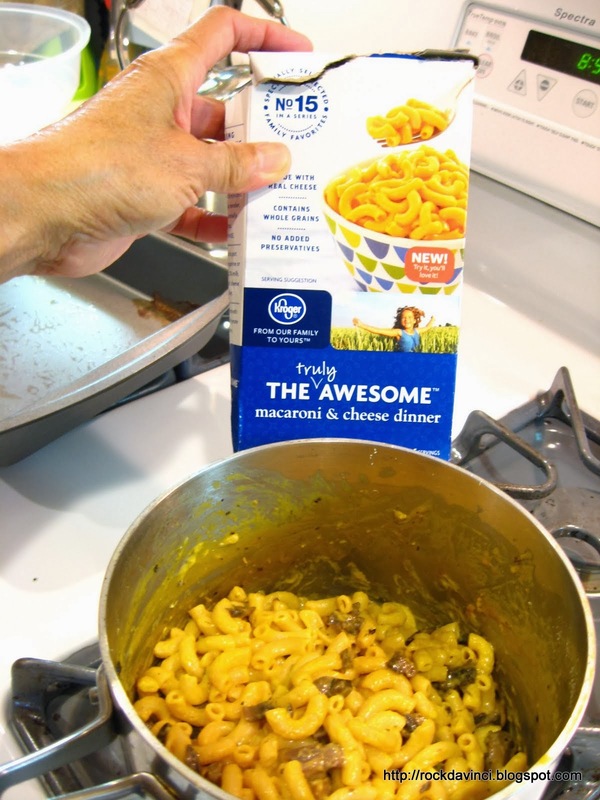 You can make Macaroni Cheese with Mushroom. Clean and chop up mushrooms. Stir fry them with some butter; salt and black pepper. Add them together. Pack your BENTO Box. Pack a small container of Peppercini. At lunch time, Top it with Peppercini, and you got tasty lunch. If you want Proteins, then add a can of drained Albacore.